Our 2018 Boondocking Rally ended with another gorgeous day. A few folks left on Sunday, and a couple left this morning before we got out and about. Most were leaving today, but a few were hanging out for another day or two - after all, it's a free 14-day camping area, and we had a few days left. The goal was to leave around 10:00 and head to Mojave National Preserve which is sandwiched between I-15 and I-40 on the California/Nevada border. With fuel being more expensive in California, I took the truck into town for a fill-up, and I dropped off one last bag of trash at the waste transfer station (open Sunday through Wednesday from 7:30 a.m. to 2:3o p.m. in the winter) just north of town. Oh yeah, the time changed over the weekend as the rest of the country went to Daylight Saving Time. But Arizona doesn't change time - they stay on Mountain Standard Time year round. So, we didn't have to change our clocks. And because Mountain Standard Time is now the same as Pacific Daylight Time, we won't have to change our clocks when we go into California and Nevada. Linda packed up the inside while I was gone, and I packed up what remained on the outside and loaded our bikes onto the rack on the Jeep. We said our goodbyes to those that were still in what was left of our desert circle with our usual hugs and handshakes. Many we will see at our upcoming RV-Dreams Reunion Rally in Pahrump, Nevada in two weeks. Unfortunately, our Canadian friends Rick & Kathy and Steve & Dianne won't be able to join us as they have to get back to Canada. 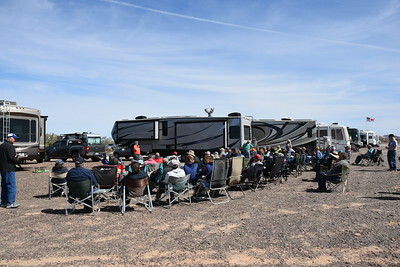 By the way, a big thanks to Steve & Dianne (Living The Dream) who have organized and held several gatherings in the southwest over the years for our RV-Dreams family. They have been quite instrumental in keeping our western folks connected while we've been in the east. 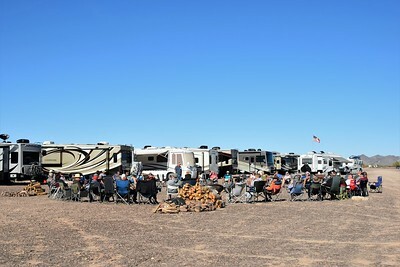 And Dianne just posted a great recap of the Boondocking Rally with some wonderful photos. We pulled onto the pavement on Plomosa Road around 10:30, not bad considering all our goodbyes. We drove the few miles back into town to dump our tanks at The RV Pit Stop and to top off our propane. Linda fueled up the Jeep, and got some jugs of filtered, reverse osmosis water (quarter a gallon or five gallons for a dollar) at The RV Pit Stop. 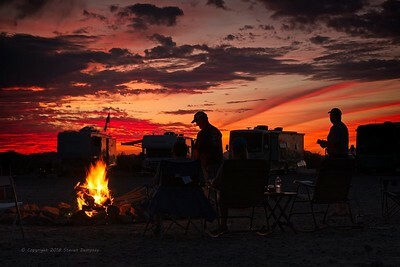 We would be boondocking in a campground without hook-ups for the next four nights before making our way to Pahrump. By 11:00, we were back on the road for today's 165-mile drive. We took AZ Hwy 95 north to Parker, a route we've been on a few times before, and then we took a connector road across the Colorado River and into California where we picked up CA Hwy 62, a new route for us. That was a pretty drive with some hills, some roadside flowers, and desert and mountains all around. We saw a few boondockers camped out on the surrounding public land. Eventually, we had to stop at a California agricultural inspection station at the intersection with U.S. 95. I was asked "Do you have any citrus of any kind? ", and I replied "We have some oranges in the refrigerator". The lady inspector asked "Did you get them at a grocery?" to which I said "Yes", and she said "Have a nice day" and waved me through. Coming out of the inspection station, I made an immediate right onto U.S. 95 north, another lovely drive with a few twists and turns as we made our way towards Needles, CA. It was sunny with a temperature around 75 and a speed limit for truckers and anyone towing of 55 mph. I had my windows down and my radio up and today I was really feeling the freedom of the road unlike I've felt in quite a long time. I'm so glad to be back in the west with plans for new exploration most of the remainder of this year. 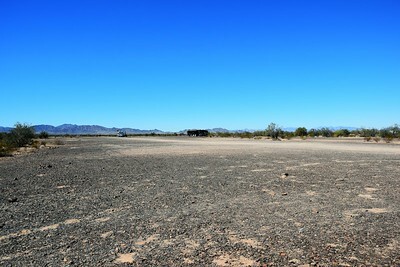 Now, our last task on our trip today before arriving at the Mojave National Preserve was to take on water. 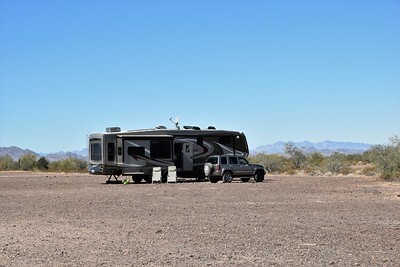 When I was doing my research and checking on camping in the Preserve, the official website indicated that the water sources usually available in the two developed campgrounds were not going to be available until later this year. We don't like to travel with a full tank of water any farther than we have to, so I called around. The closest gas station to the Preserve didn't have a place to take on water, but the Shell station on the north end of town in Needles said they would allow us to take on water. I checked the satellite view to make sure we could get in and out okay. It wouldn't be ideal to haul the water another 60 miles, but you gotta do what you gotta do. As we approached Needles we saw a sign for the Shell station on the south end of town advertising an RV dump station and tank fill. 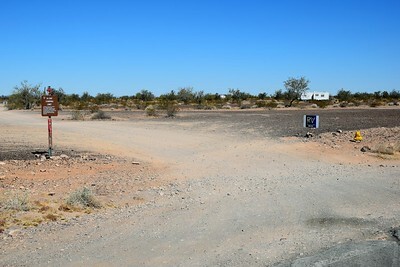 I noted that this dump station was not shown on the usual RV dump station websites I checked earlier. Thinking that Shell might be easier, we made that our target. However, on approach, I saw no signs for the dump or water and no easy way to get in or out of that small station with a big rig. So I passed by and pulled in next door at the much roomier Chevron. Linda went back to the Shell station in the Jeep and a guy showed her the inconvenient dump station. Then he told her the Chevron would let us take on water and when asked if he was sure, he laughed and replied "Yeah, both these gas stations are owned by the same person". Well allrighty then. Linda asked the person on duty at the Chevron and got the okay. They didn't charge us for the water, but Linda purchased us some lunch and a couple other items as a "thank you". Though there was a water spigot near the back of the Chevron, it was not yet operational, but they did let us pull up and hook a hose to a different spigot. Again, it wasn't very convenient as it wasn't a pull-through situation, but there was plenty of space to pull in and then back out - much more space than at the Shell. I filled our tank to two thirds knowing we wouldn't need that much for four days, but I put in extra just in case we were unlevel and two thirds wasn't really two thirds as indicated by the sensors. When people ask us "Where do you take on water for boondocking? 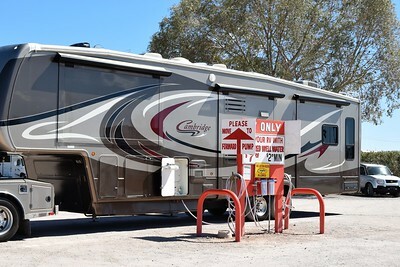 ", our response has always been 1) the water source at the campground if in a campground without hook-ups, 2) a campground/RV park near the boondocking spot, 3) a ranger station near the boondocking spot if they have a spigot and will allow it, or 4) at a gas station. This was only the second time we've pulled into a gas station to take on water, but both times they have been very friendly about it. Still, calling ahead isn't a bad idea. And it's not a bad idea to check the gas station ahead of time on Google earth or the satellite view of Google maps to make sure you can get a big rig in and out. Soon, we were back on the road. We hopped on I-40 west and soon started a fairly steep climb. There was a slow truck lane, and I was in it. Fortunately, even with our extra water, it wasn't too bad and we stayed in the 50 - 55 mph range as I watched my heat gauges closely. Going down on the other side wasn't particularly steep, and our after-market exhaust brake (Pac-brake) did exactly what it was supposed to do. The last services for several miles are located at Exit 107 at the very expensive gas station/convenience store there. 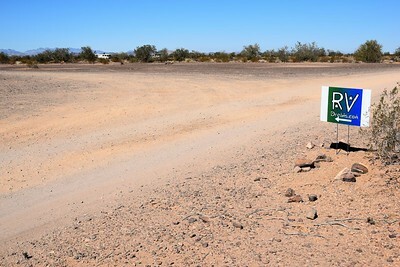 A mile to the west at Exit 106 is a Rest Area which, according to interstate signs, has water. I was thinking it would have been good to know that when we found that the Rest Area was closed for construction. Eventually, we made it to Exit 100 and took the road into the Mojave National Preserve. There was an Airstream and a truck camper stopped at the entrance sign as we passed. And then we saw the sign indicating it was 20 miles in to the Hole-In-The-Wall Campground. There is no entrance fee for the Preserve. 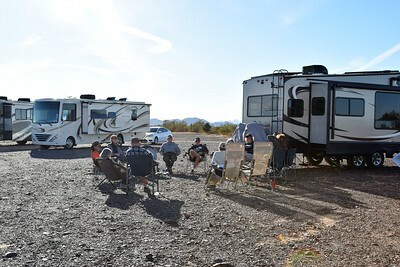 Though there are a few free dispersed camping sites in the Preserve (they call these spots Roadside Camping) that will handle RVs, we opted for the campground with its dump station, picnic tables, trash receptacles, and firepits. It would be nice if water was available, but we still wouldn't mind paying the $12 per night ($6 with the America the Beautiful Senior or Access Pass). The drive was beautiful and I just kept smiling the farther we got out into the middle of nowhere. The paved road was a little rough, but it was a bit wider than I thought it would be and we could maintain 40 - 50 mph. 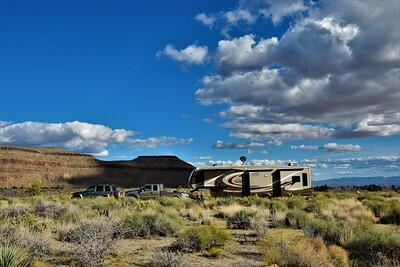 Oh, on that note, though the Hole-In-The-Wall Campground can be reached from the north coming from I-15, that route requires several miles on dirt/gravel and some campground reviews recommended against coming in from that direction. We'll check it out, as it would be more convenient for us to go out that way. The Airstream was following us now, otherwise I would have probably stopped in the middle of the road to take some pictures or our drive in. I did slow down for a couple of Black-tailed Jackrabbits. It's been a long time since we've seen those. Finally, we reached the campground. Unlike most campgrounds where we can pull off to the side of the road and then choose a site in the Jeep, there was no place to do that today. I would have been happy to let the Airstream go around, but it wasn't happening. 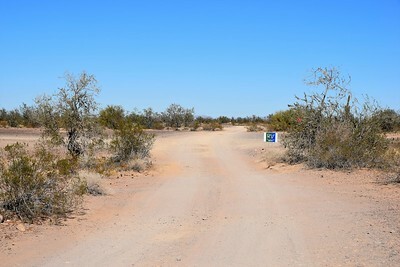 So, I continued on the narrow gravel campground road and we assessed the first-come, first-served sites that were open. We passed a couple of nice ones, but I had read that there were large, nice sites the farther into the campground you go. 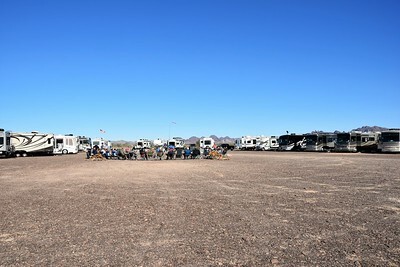 At the time we were clearly the largest rig in the campground, and many sites would not be easy to back into from the skinny road. There are some pull-through sites that will accommodate large rigs. The campsites are all pretty large, so it's just a matter of being able to get the swing room to back into some. We settled on Site 23, and got backed in fairly easily on the first try. The site is long enough for us to unhitch and get the Jeep in. We were all set up by around 3:00, and I love it here already. 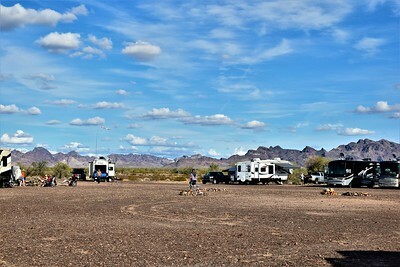 The campground sits between some small mountains and we have views in all directions. Surprisingly, we have pretty good Verizon data service here in the campground. The coverage map shows much of the Preserve doesn't have service, but it is good enough in the campground that we don't even need our external antenna or booster. I deposited our check for four nights in the self-pay slot near the entrance, and didn't waste any time getting my bearings. I walked to the nearby Visitor Center to get more information on hikes and highlights and picked up some maps. We're at 4,400 feet elevation, so it's cooler than down in Quartzsite or by the Colorado River. This morning, several folks at the Boondocking Rally headed over to the Gold Eye #2 mining claim where a fellow by the name of Steve Hunt holds the claim and offers tours of the mining area. It's not my kind of thing, so I stayed at our camp and kept watch. Well, I may not have watched too closely as my attention was on basketball tournaments ... and I may have squeezed in a nap. When everyone got back, I heard that it was pretty interesting. I made the rounds and talked with a few folks for awhile. 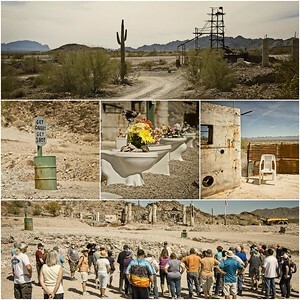 Here's a photo collage of the mine tour from Steven Dempsey. We continued checking in with everyone, and the afternoon was used by many to prepare for the evening's potluck. At the potluck, we had some guests, and got a group photo. 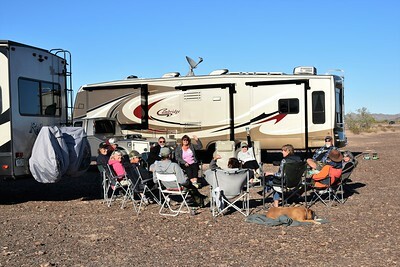 We had six couples (seven including us), that attended our 2012 RV-Dreams Fally Rally in Harrisburg, Oregon in September of that year. 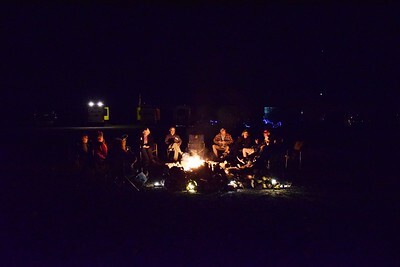 After our potluck, we had our evening campfire for a while, and then called it a night. Today was a strange day. We weren't expecting any rain this week, but it was cloudy all day today and we had off and on drizzle. Linda went into town with Leesa to do laundry, but everyone else pretty much stayed inside until it was time to make a trip to The Desert Bar. 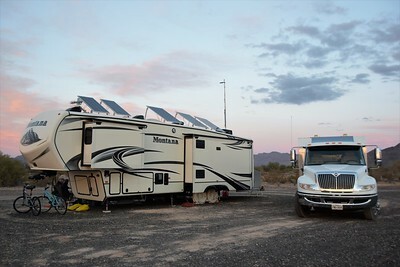 Several went to the the iconic bar outside of Parker, AZ, while a few made a trip down to Mexico, and some hunkered down in their rigs. It was an "on your own" kind of day. Having been to the Desert Bar before, I again bailed out and stayed back to watch more college basketball and get some work done. Those that went enjoyed their time. When everyone got back, it was still a bit ugly out, so no one started a fire and everyone called it an early night. A completely cloudy day caused some challenges for the folks with solar, and generators ran a bit longer today. This morning we were back to our usual great weather. 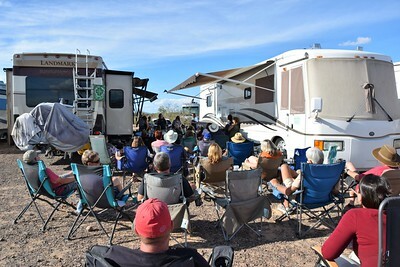 We did a seminar on boondocking resources and boondocking etiquette. We talked quite a bit about finding boondocking spots, and I put together a list of links to email to everyone. After the seminar, we had a solar oven demonstration by Cinn. Cinn, a solo, also has a composting toilet as does another solo, Paula. The other day, they gave everyone some great information on how that is working out for them. Later, it was decided to have an Instant Pot demonstration/tasting session at 4:00. 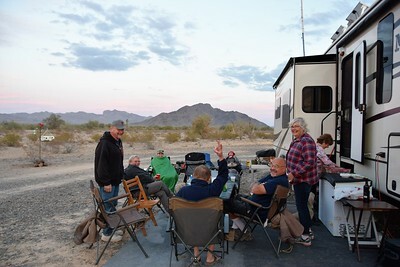 We had finished up our one-on-one sessions, and I made a couple of programming changes to some battery monitors while Bill completed a solar installation, and Colan worked on some RVs. We have at least three rigs that have bad batteries, and a few more learned the importance of battery maintenance. We confirmed what we thought was the case - several manufacturers are still installing Marine/RV dual purpose batteries rather than "true" deep cycle batteries. Of course it is a cost savings to them, but they won't hold up to as many discharge/re-charge cycles as "true" deep cycle batteries. And after some of the wiring mistakes and monitor programming mistakes we saw, we are so very thankful for the quality of our battery bank/inverter/solar install as done by our friend Jack Mayer. Jack, our system is still working great after ten years, and we can't thank you enough. I walked over and watched golf and the NCAA college basketball tournament selection show with Gary, and then we gathered for the Instant Pot demo. We had two generators, four Instant Pots, and an air fryer. The ladies prepared chicken marsala, pork chops with gravy, shrimp scampi, potato salad with hard-boiled eggs, air-fried cheese sticks, and a standard box cake. There were a couple of snafus in this un-rehearsed demo, but those that were interested were quite happy with this impromptu demonstration. I took a few more photos of our rigs on this beautiful afternoon. And with that, all we had left for this Boondocking Rally was one last campfire. 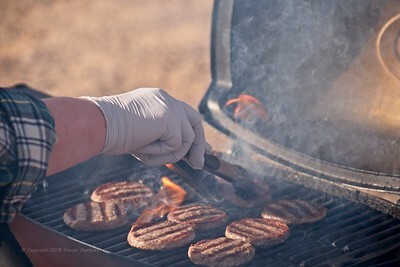 Pat has been our firestarter this week using his Cajun Dragon propane wand. He also made trash runs for us to the nearby waste transfer station. Thanks Pat. We sat around the fire and chatted looking up from time to time to marvel at the natural planetarium above us. It was a fantastic way to end a great week. We had a lot of help, and we really appreciate everyone's attendance and assistance. We hope you enjoyed the rally and learned a little bit as well. Safe travels! After a lovely, quiet evening, generators started coming on at 7:00 a.m. sharp. We have quiet hours from 10:00 p.m. to 7:00 a.m., so no generators during that time. But many only have generators as a way to charge batteries, so a few always come on as early as possible. 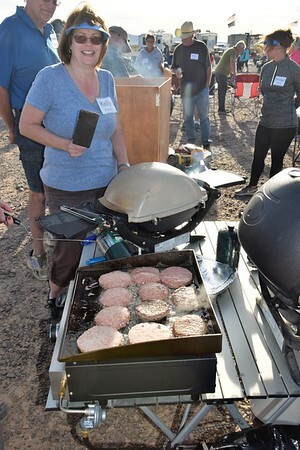 I went out and cooked a little breakfast on my Blackstone Griddle and then we had a morning seminar at 10:00 on fresh water management and wastewater holding tank management. After that, we chatted in groups and mingled for awhile. The last two rigs we were expecting came in and we got them parked. In the afternoon, Linda had a T-shirt braiding session. Everyone was on their own for dinner, and then we all brought out chairs and enjoyed our three campfires. 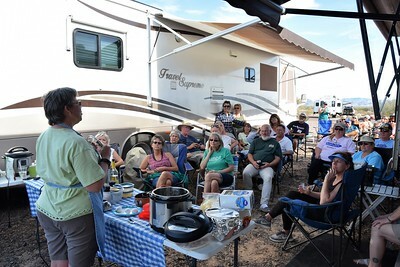 Many of us know each other, but it's great to sit around and get acquainted and listen to everyone's RVing stories. We called it a night a little after 10:00. This morning, I was up early and went outside to take a couple of sunrise photos. 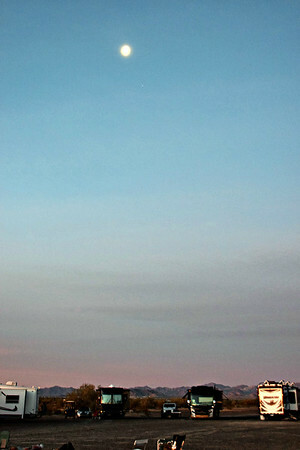 The moon was still hanging high in the west. Eventually, everyone came out of their RVs and we had another morning seminar. This morning we talked about RV electrical systems, batteries, battery maintenance, and solar. I could see concepts starting to make sense to many of our new boondockers. And Linda & I offered private one-on-one sessions to answer questions and go through individual rigs to verify equipment and explain what capabilities they have and how to monitor their batteries. 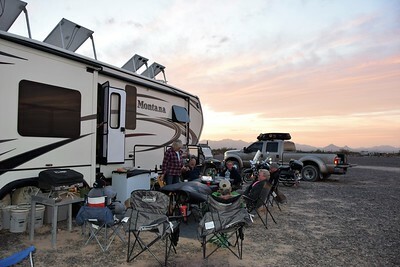 As we've mentioned many times over the years, the batteries are the heart and soul of RV electrical systems, and they affect many parts of RV operation in ways that many people don't know. Being off-grid exposes battery problems and we have a few that have already discovered they need to replace batteries (as we do at every Boondocking Rally). So, we have about a dozen coaches that we'll be visiting in the next few days. Today stayed fairly cloudy all day, so even those of us with solar, may have to run our generators a bit. In the evening, we had a potluck meal with everyone bringing a little something. And, as usual, no one went away hungry and the home-cooked dishes were delicious. 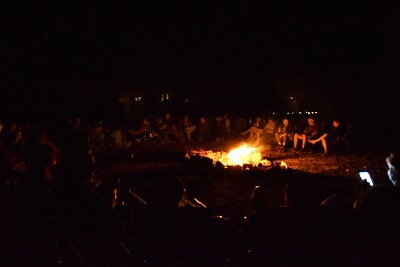 And, of course, we ended our evening with campfire conversations. This morning, we had a community breakfast. Linda & I furnished eggs, sausage, and pancakes and we had three cooking stations going. Linda and Kelly made biscuits, and Kelly whipped up some gravy for biscuits and gravy. Patti incorporated blueberries at her pancake station. Larry & Jody made breakfast burritos; Geri brought a french toast casserole; and there were doughnuts, cinnamon rolls and more. It was breakfast heaven out in the desert. 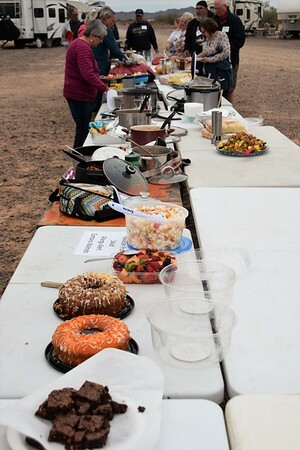 Thanks to all of our volunteer cooks and thanks to Steven Dempsey for the breakfast photos. If you aren't familiar with Steven's photography, check it out at Steven Dempsey Photography. After breakfast several folks continued to talk until it got a bit hot out in the sun. Linda & I continued our rounds of one-on-one sessions answering questions, identifying equipment locations, and explaining what their equipment monitors were displaying (if they had them). Sometimes, it just came down to helping interpret the equipment manuals. I think there was quite a bit of napping in the afternoon. I watched some basketball - it is college basketball tournament time after all. 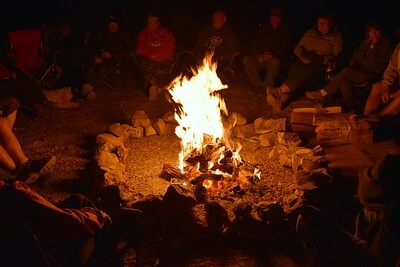 Later, we seemed to get a second wind, and enjoyed some group chats until it was time to get a fire started. Steven took this wonderful photo of the gorgeous sunset. My pics are much less professional. Linda and others stayed out pretty late. I was long in bed and asleep by the time she wandered home. 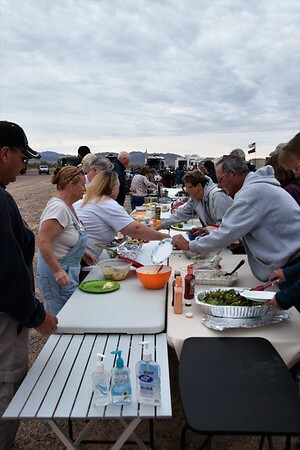 Tomorrow, we have a gold mine tour on the agenda, and in the evening we are having a potluck dinner that includes anyone from our RV-Dreams Family that is in the area and wishes to join us. 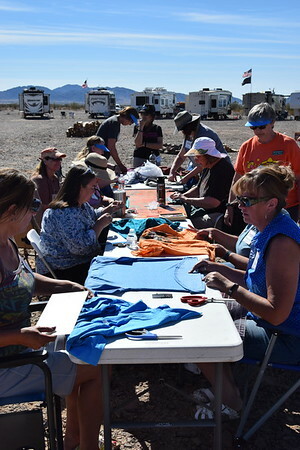 The Boondocking Rally is going quite well, and it is so fulfilling to watch people learning and getting more confident in their boondocking knowledge and abilities. That's what this rally is all about. 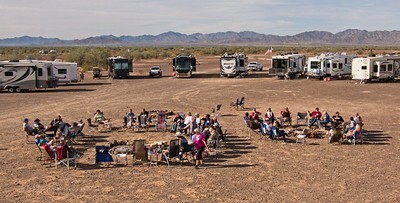 Today was the official start to the 2018 Boondocking Rally, but it was mostly a day of arrivals and parking with an evening cookout and campfire. Lots of folks arrived between 11:00 and 2:00, and then we had a lull until about 4:00. By 5:00, all but two rigs had arrived, and we expected those last two to come in tomorrow. In the afternoon, a small group gathered in the middle of our circle, and then it kept getting larger and larger. 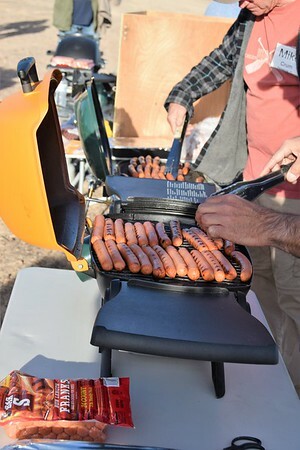 At 5:00, we furnished hot dogs, hamburgers, chips, and cookies, and we got a few volunteers to bring grills and help with the cooking. And Kathy & Rick brought us this beautifully decorated cake. 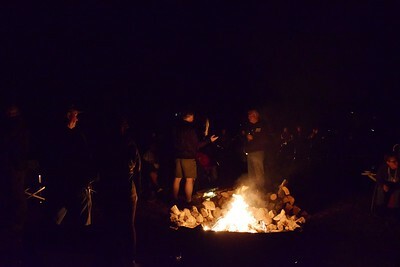 After the welcome dinner, we gathered around three campfires and enjoyed the beautiful dark sky. 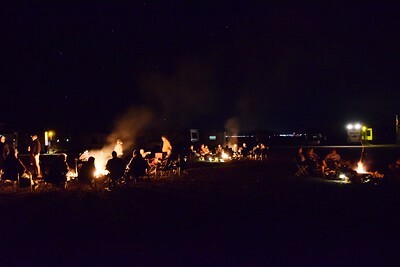 Constellations were bright and everyone seemed to enjoy our evening together in the desert. 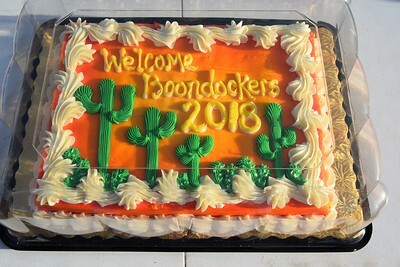 About half of our attendees have never boondocked more than one night and, on the other end of the scale, we have several very experienced boondockers including many that were at our very first boondocking rally in 2013. We also have an RV tech, Colan, on hand and Bill with RV Solar Solutions is here as well. It's a great learning environment. Tomorrow morning, we'll do a seminar on fresh water and wastewater holding tank management, and let the rest of the day unfold as it will. It was a bit chilly and breezy this morning, but I knew we were going to have a few rigs come in today (Sunday) for the Boondocking Rally which officially starts tomorrow. We had emailed directions and GPS coordinates previously, but I wanted to put out a couple of signs to help navigate to our spot. but soon others joined us and had the views of the surrounding mountains. 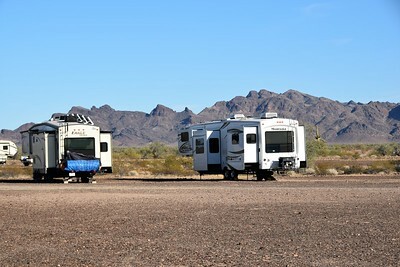 A few people staying at the La Paz RV Park south of Quartzsite, did a scouting run before coming out tomorrow. 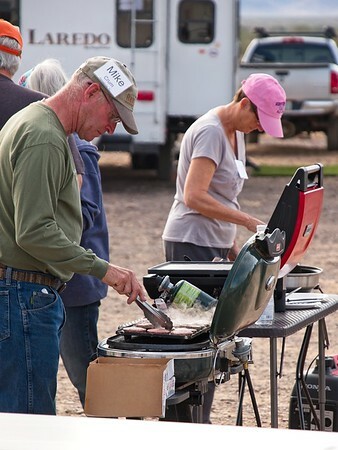 Former rally attendees Mikki & Jay are managing that park, and they gave us a special offer for those coming to the Boondocking Rally for stays before and after. 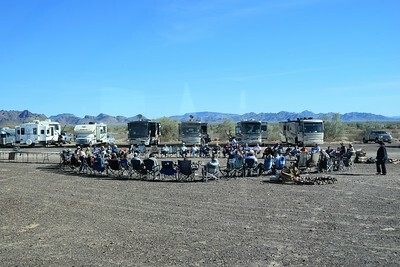 By the end of the day, we had about ten rigs, and just gathered up in a circle to chat a little. It was a beautiful day, and the wind died down as we met some new folks and got reacquainted with some long-time friends. But as the sun went down and it got cooler, we all decided to call it a night. Tomorrow, we'll have another 30 or so rigs coming in and the Rally will begin. We needed some groceries including food for the opening night of our Boondocking Rally. We considered making a run once we got to Quartzsite, but we ultimately decided to get it all done at the Walmart in Surprise this morning. After the grocery run and stuffing it all into our fairly large RV refrigerator, we got packed up and ready to go. Though my target time to pull out was 10:00, we got moving around 10:45. 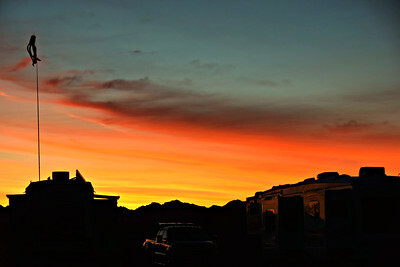 It was an easy drive around the Sun Valley Parkway and west across I-10 to the familiar exit at Quartzsite, Arizona. 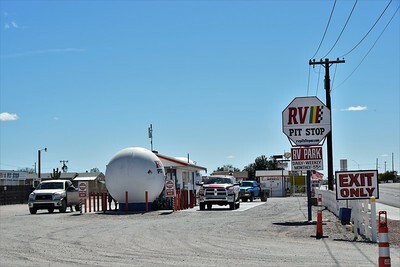 Turning north on AZ Hwy 95, we made a stop at The RV Pit Stop, a year-round business where you can get propane and water and dump tanks before venturing out into the Bureau of Land Management (BLM) public land. I pulled in and got propane first - $2.10/gallon, and then I pulled forward into one of the water filling stations. They charge for water based on the length of your RV under the assumption that the longer you are, the larger your fresh water tank is. Prices range from $2 to $7 to fill your tank. They use filtered well water. After filling up our 100-gallon tank, I exited and turned around to go back into the entrance to dump our tanks. Again, they charge by the length for dumping. 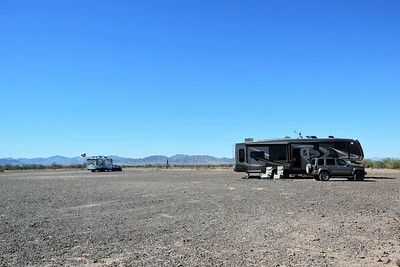 While I was doing that, Linda went ahead to start scouting for a spot in the desert where we could arrange 40 rigs for the Boondocking Rally. We have a spot we like off of Plomosa Road, so she stopped at the BLM host site right off of Hwy 95 and got our permit. It's a 14-day free camping area, but you are still supposed to get a permit. After 14 days, you are supposed to move at least 25 miles to prevent folks from homesteading on the public land (which some will attempt). I found Linda where we agreed to meet and parked the rig just off the pavement. Nathalie & Brock, who attended our 2012 Fall Rally in Oregon in a pop-up, were there as well. They came in last night and were waiting for us to arrive to select the venue. 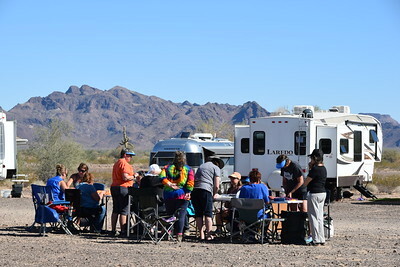 The place we had the Boondocking Rally in 2013 was occupied by a couple of rigs, and we just don't encroach on people (especially with 40 RVs). So, we followed Nathalie & Brock to another spot a little farther of the pavement that was empty. We decided it would work fine, so we went back to our respective rigs to make the move. As we pulled into the area, I made a wide, sweeping turn on the rocks and then, uh oh. I stopped moving. Just below the rock surface was a fine powder, and my dual tires and the trailer tires sunk. In the times we've been here, we've never seen anyone sink on what seems to be hard-packed rocks. We were stuck, and our truck isn't four wheel drive. Fortunately, Brock has a four wheel drive, so our plan was to unhitch, get the truck out, and have him pull us onto solid ground. We managed to get unhitched, but the truck still wasn't going anywhere. Linda decided that we would re-hitch and have Brock tow both the truck and fifth wheel (with its extra 833 pounds of water) out. We carry a folding shovel and tow strap for just these types of situations. I dug out our dual rear wheels and our mud flaps, while Brock dropped their fifth wheel and got into position. We were able to get re-hitched. I put some leveling blocks in front of the tires to give some traction moving forward, and we looped the tow strap through the tow rings on the front of our truck and tied it to Brock's receiver hitch. Brock pulled while I was in our truck in low gear giving it a little gas. With a big sigh of relief, he was able to pull the truck and the trailer to solid ground. We should have gotten pictures of all of that, but in that moment we were focused on a solution and not the blog. Nathalie got some photos of us hooked to their truck, and Brock loved having the pictures of a Chevy towing out a Ford. Perhaps we'll get some copies and post later. So, that was the fourth time in 13 years, that we've gotten stuck and needed a four wheel drive to assist. Of course, when we bought our truck in 2005, we didn't know we would be going into places where we might get stuck. All we knew was that the 2WD had a higher towing capacity than the 4WD and that it was a little cheaper. Buying a truck now, would we go with 4WD? Linda is pretty sure we would, but I'm not so sure. Four times in thirteen years does not scream to me "necessity". The leveling blocks we used were completely buried under the soft sand, but we were able to locate them and dig them out. The four of us decided that we didn't want to take any chances with anyone else's rig, so we nixed that spot and went in search of another. Linda had spotted another place in her earlier scouting, and we determined it was completely solid. That would be our new rally location. So, we moved our rig and Brock & Nathalie moved their toy hauler into their preferred position. The early arrivals get their choice of the direction they want to face. We went with our usual north-facing position. Looks like plenty of room for 40 rigs. While Linda got the inside set up, the other three of us picked up rocks and established a central firepit. We'll add a couple more once everyone arrives on Monday as it's impossible to keep 80 people warm with a single firepit. So, we were a little later getting settled than we had planned, and we had plans to join some other folks in the area for dinner. I called to tell them we'd be arriving around 5:00 or so. It's actually divided up into multiple sections such as La Posa North, La Posa South, La Posa West, etc. There are no designated campsites or hook-ups, but there are dump stations, places to take on water, and dumpsters for trash. The permit to stay there is $40 for two weeks or you can get a season pass for $180 which allows you to stay there for up to seven months from October through April. Tonight we were visiting La Posa South. The first part of the road is paved, and then it turns to gravel and we needed to go at least three miles on on the 15 mph road, so we were going to be a little later than expected. Eventually, with some help from our host on his quad, we found everyone. 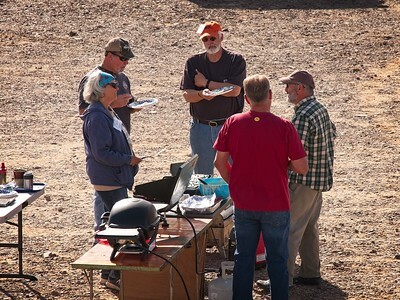 This gathering was organized by Ruth & Dale, five-year full-timers that were also at our Oregon Rally in 2012. But we were hosted by Les & Sue who have been a big part of our Forum and Community for several years, but whom we had never met. 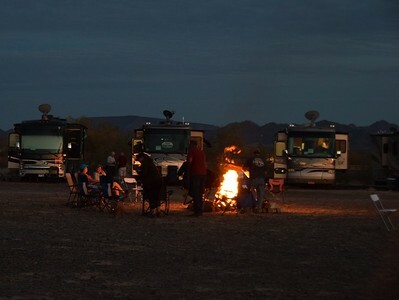 While we were in the east the last few years, RV-Dreams rally and forum folks have been gathering around Quartzsite in the winters, but we still haven't met all of them. It was great to finally meet such nice people that do the research and provide valuable advice to the novice RVers. Here is their set-up. We also met Ron & Beth on the right below. After chatting a bit, Sue brought out a buffet meal that was delicious. We ate quickly, as it was pretty windy and getting colder by the minute. Ron & Beth took our business card and headed back to their RV park, while the remaining six of us went inside where it was much more comfortable. We picked Ruth's brain about their home state of Washington, our summer destination this year, and we talked about RVing and how we all got here. Around 9:00, the yawns hit me, and we decided it was time to break up the party. 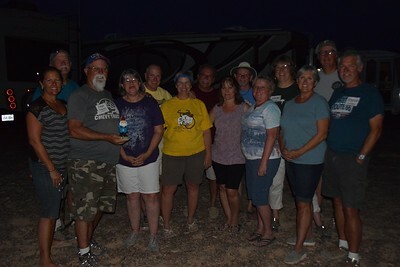 Thanks Ruth for organizing this little get-together, and thank you Les & Sue for hosting us and being great ambassadors for the RVing community. It was wonderful to finally meet you. It was close to 10:00 by the time we got back to our rig. Our batteries were fully charged, and all we wanted to do was get showers and go to bed. It had been windy all afternoon, and it didn't look like that was going to stop, so we pulled in our bedroom slide to keep the topper from flapping and we plopped into bed for the evening. Whew, that was a long day. Well, on Wednesday, after dropping off our rig at APR RV, we had breakfast while trying to figure out where we were going to stay for a couple of nights. With major league baseball's spring training in full gear, hotel prices have been increased. The Cactus Leauge plays at ten stadiums in the Phoenix-Scottsdale-Mesa-Tempe-Surprise area, and the Chicago Cubs and Oakland A's play in Mesa. We looked at airbnb, VRBO, and even some RV parks for rentals, but couldn't find anything on such short notice. Fortunately, we had a free night accumulated from our hotel stays at the various RV shows this winter, and we booked a suite at the Baymont Inn & Suites in Mesa. After breakfast, we found a laundromat. Linda did laundry while I fetched some new, long overdue, windshield wipers for the truck. My time was spent on taxes. In addition, to our normal complexities, this year Linda started her tea business, we started our new Nature Travelers website, sold a house (my parents' former dwelling), and bought a rental house in The Villages. All that complicates our 2017 filings quite a bit. It's a good thing we keep very detailed records and documentation. But it's still horribly tedious. 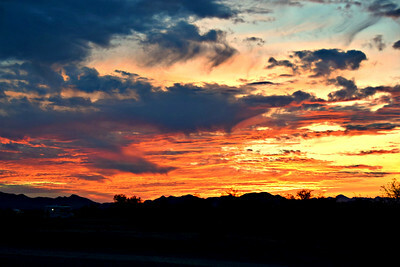 On Thursday, we drove south to Casa Grande to visit with Jim & Terry and John & Jade. Jim and John are twins that have been following us for years and who we've had the pleasure of visiting with multiple times. 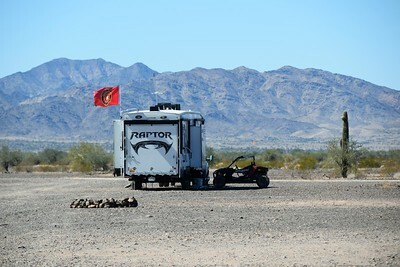 They were at our first Rally in 2008 and were planning to come to the Boondocking Rally. Unfortunately, Jim came down with infectious pneumonia and was hospitalized for 19 days. 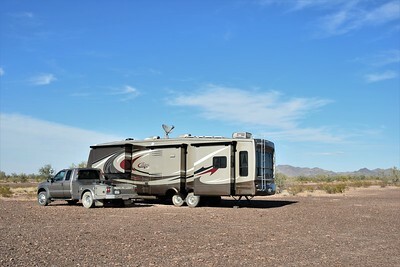 He has a two-month recovery process at the RV park in Casa Grande. So, we decided to drive down to surprise him. And we also wanted to meet Jade, the new lady in John's life. We arrived and sat out in the warm sun chatting for a little bit before heading off for lunch at the Big House Cafe, which is owned by the family of someone Jim met at the hospital. We had a wonderful meal - I had their best seller, the BBQ Cuban and had to take half back to the hotel. It was almost 2:30, by the time we broke up the party. Thanks for lunch, John. Jade, it was great meeting you and getting to know you a little bit. Terry, always a pleasure to see you. And Jim, we sure wish you well with your recovery and rehab - know that we are keeping you in our thoughts and sending positive vibes. On our way back to the hotel, we stopped at Walgreens. We have recently switched our prescriptions from Walmart to Walgreens as we've had a few too many recent screw-ups with the Walmart pharmacies. We joined the Walgreens Prescription Savings Club ($35) and we'll make that up in savings on Linda's prescription in just a couple of months. My prescriptions will cost a little more, but overall we should come out ahead. Now, we'll just have to see if they are more competent than Walmart - so far, so good. I finished the night continuing the work on the dreaded taxes. This morning Linda called APR RV to check on the progress on our rig. Unfortunately, they needed to keep the rig all day as they wanted to make sure everything was dry before we picked it up. We had to check out at 11:00, but once again, the hotel allowed us to set up shop in their lobby. Since we were picking up the rig at rush hour and we don't drive at night, we decided to return to John & Darla's place for the night after making sure it was okay with them. Eventually, we left to have lunch. Then Linda did another load of laundry while I found a Great Clips to get my hair cut. By that time, we went to pick up our rig. We paid our bill, and were just getting ready to pull out, when a car pulled in with faces we recognized. Paul & Mary winter in the area and were just driving by when they saw our rig. They pulled in for a quick chat and hugs. We hadn't seen them since a chance meeting in an RV park in Wyoming a few years ago. But they are coming to our Reunion Rally, so we'll have a chance to catch up more in a few weeks. We got on the road prepared for the 85-mile drive back to Surprise in rush hour traffic. The first part of the drive and the last part of the drive were free and easy and we watched a half dozen hot air balloons in the clear sky as the sun started to go down. However, the middle part was three to four lanes of bumper-to-bumper traffic. I just don't know how we used to deal with that in our prior life, and I can't imagine doing it twice a day every day now. Eventually, we made it back to Surprise, and got parked just as the last glimmer of light was fading. Tomorrow, we'll get up early and make a trip to the grocery to stock up for our time in the desert, and then we'll head west for the 120-mile drive to Quartzsite. I'm definitely ready to get away from the city and we're looking forward to seeing old friends and meeting new ones at the Boondocking Rally.